A new image of the Trifid Nebula, named by English astronomer John Herschel, was taken with the Wide-Field Imager camera attached to the MPG/ESO 2.2-metre telescope at ESO’s La Silla Observatory in northern Chile. Three different regions of the nebula can be seen in the image. A rare combination of three different types of cosmic cloudsknown as nebulas can be seen in a new image of the Trifid Nebula, a smolderingstar factory 5,500 light-years away. The image, taken by astronomers at the European SouthernObservatory (ESO) in Chile, provides a glimpse at the early stages of a star?slife, from gestation to first light. The heat and "winds" of newly ignited, volatilestars stir the Trifid?s gas- and dust-filled cauldron; in time, the darktendrils of matter strewn throughout the area will themselves collapse and formnew stars. 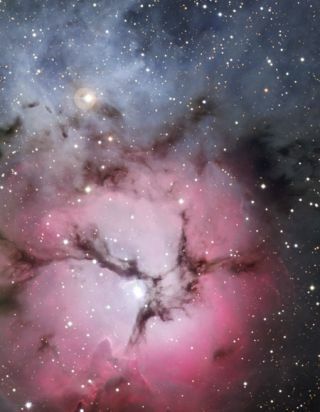 The Trifid takes its name from the dark dust bands thattrisect its glowing heart. The French astronomer Charles Messier first observed theTrifid Nebula in June 1764, recording the hazy, glowing object as entry number20 in hisrenowned catalogue. Observations made about 60 years later by John Herschelrevealed the dividing dust lanes, inspiring the English astronomer to coin thename "Trifid." Made with the Wide-Field Imager camera attached to theMPG/ESO 2.2-meter telescope at ESO?s La Silla Observatory in northern Chile, the new image prominently displays the different regions of the Trifid Nebula asseen in visible light. In the bluish patch to the upper left, called a reflectionnebula, gas scatters the light from nearby, Trifid-born stars. The largestof these stars shines most brightly in the hot, blue portion of the visiblespectrum. This, along with the fact that dust grains and molecules scatter bluelight more efficiently than red light ? a property also responsible for ourblue skies and red sunsets ? imbues this portion of the Trifid Nebula with anazure hue. In the round, pink-reddish area typical of an emissionnebula, the gas at the Trifid?s core is heated by hundreds of scorching youngstars so that it emits the red signature light of hydrogen, the major componentof the gas. The gases and dust that crisscross the Trifid Nebula make upthe third kind of nebula in this cosmic cloud, known as dark nebulas, courtesyof their light-obscuring effects. Within these dark lanes, the remnants of previous star birthepisodes continue to coalesce under gravity?s pull. In the lower part of this emission nebula, a finger of gas pokesout from the cloud, pointing directly at the central star powering the Trifid.This is an example of an evaporating gaseous globule, or "EGG", afeature also seen in the iconicEagle Nebula, another star-forming region. At the tip of the finger, a knotof dense gas has resisted the onslaught of radiation from the massive star.